A-HOTEL.com - Luxury and cheap accommodation in Bol'shoy Kaim, Russia. Prices and hotel, apartment booking in Bol'shoy Kaim and surrounding. This indicative offer was derived from the most recently booked accommodation in Bol'shoy Kaim and sort by the price, from cheapest Bol'shoy Kaim accommodation to the most expensive hotels. To select accommodation by your preferences we recommend to choose from 1 accommodation offers in Bol'shoy Kaim in total. By entering the dates of your overnight stay in Bol'shoy Kaim and using the filter tools you can sort the best possible accommodation for you. The entered dates of your stay are crucial for the most accurate offer as it derives all the online information on pricing and availability of Bol'shoy Kaim accommodation. Then you can book the selected Bol'shoy Kaim lodging (hotels, apartments etc.) immediately. Situated in Bol'shoy Kaim, Hotel Usadba Sarzhevskikh on Biryuzovaya ulitsa 1 features accommodation with a flat-screen TV. The restaurant at the holiday park specialises in Russian cuisine. 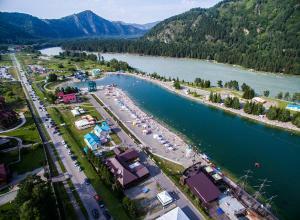 Set in Nizhnekayancha, Altai Palace Hotel provides a casino, seasonal outdoor swimming pool and tennis court. Guests at the 4-star property can enjoy mountain views in the rooms and access to a fitness centre. Offering a terrace, Touristic complex Taiezhnik is on the foor of the Cherepan Mountain. Manzherok is 5 km away. Situated in Manzherok, Manzherok Turistskiy Complex provides accommodation with free WiFi and access to a garden. A balcony with mountain views is offered in all units. Set in Manzherok, 10 km from Manzherok Ski Lift, Gornoe Solntse features accommodation with a terrace. Boasting room service, this property also provides guests with a children's playground. Hotel Malina offers accommodation in Biryuzovaya Katun Special Economic Zone. The hotel has a seasonal outdoor pool, children's playground and terrace, and guests can enjoy a drink at the snack bar. Situated in Manzherok, 9 km from Manzherok Ski Lift, Green Landiya features a terrace and views of the mountain. Among the facilities of this property are a restaurant, a 24-hour front desk and room service, along with free WiFi. Featuring a terrace, Mountain Guest House Mill is set in Manzherok, 9 km from Manzherok Ski Lift. Boasting a 24-hour front desk, this property also provides guests with a children's playground. Set in Katun, Guest House Terem features a garden. All rooms boast a flat-screen TV with satellite channels and a private bathroom. Set in Gorno-Altaysk, Chalet Priskalniy provides accommodation with an outdoor pool, free WiFi, a terrace and a bar. The accommodation has a sauna. Situated in Manzherok, Tavda Inn features a terrace. The property is located 8 km from Manzherok Ski Lift. Featuring a sun terrace, BBQ and outdoor swimming pool, Hotel Park Otel Manzherok is located on banks of the Katun River. This property offers a sauna, hammam, billiards and table tennis. Located in Manzherok, Usadba Zorkinykh is 5 km from Manzherok Ski Lift and offers various facilities, such as barbecue facilities. Boasting a shared kitchen, this property also provides guests with an outdoor pool. Dom na Beregovoy is located in Manzherok and features a gazebo, sauna and outdoor pool. Free WiFi is provided. Located directly on the banks of a river near the village of Manzherok, Cottage Arjan and Gostevoy features a seasonal on-site restaurant, a river beachfront, a sauna, and free Wi-Fi throughout the property. Accommodations here provide guests with a microwave, a refrigerator, a flat-screen TV with satellite channels, a seating area, and a private bathroom with a shower. Located in Manzherok, Usad'ba Manzherok features accommodation with free WiFi, within 5 km of Manzherok Ski Lift. The country house offers a seasonal outdoor pool. Set in Manzherok, Altay Park Hotel Podgoritsa is 12 km from Manzherok Ski Lift. Free WiFi is at guests' disposal. Providing free WiFi, Apartments on river Katun` is located on the beachfront in Manzherok. This apartment provides accommodation with a terrace. Located 400 metres from Katun River in Manzherok village, this accommodation features a steam bath and a shared kitchen. It also offers rooms with eco-friendly décor. Set in Manzherok, 4.1 km from Manzherok Ski Lift, Siberian Ski Club features accommodation with free WiFi, barbecue facilities and a terrace.